Please contact your library to renew your account or your card will expire. Your card will expire soon. SELCO has added some custom work into Enterprise to better facilitate borrowers searching for a particular format of a title, whether that’s a book, DVD, etc. Also, in addition to the icons which appear in the results and details, there is now the corresponding text for what the image represents. This removes the need to hover the mouse over unknown icons to determine what they represent. As this is custom work, it’s possible that there’s a scenario we missed in our internal testing. If you find inconsistencies, please let the SELCO Help Desk (helpdesk@selco.info) know with examples so we can adjust the code. SELCO has added an enhancement to the Checkout History for borrower accounts in Enterprise. The list is now be sortable by title, checkout date, or return date. Additionally, the titles now link to searches in your version of the catalog. The actual record numbers aren’t included in history so a more direct link wasn’t possible. This was custom work so it is possible a scenario arises which wasn’t found in our testing. If a break is encountered, please let the SELCO Help Desk (helpdesk@selco.info) know the problem and the borrower record where the error occurs; if it is for a specific title, that too. As requested by the ILS Operations & Technology Policy Joint Committee, SELCO has created generic user accounts in Horizon. Feel free to use them or not, as best suits your library. 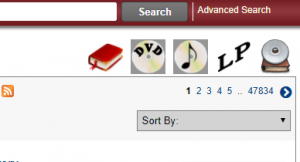 Some libraries find it useful to use generic accounts at their circulation desks, so one person’s Horizon account doesn’t have to be logged in to multiple computers. Emails have been sent to library directors and automation contacts. Please consult the emails or your supervisor for more information. Please feel free to contact the Help Desk with any questions! The Digital Millennial Copyright Act (DMCA) instituted rules to protect online service providers from liability for copyright infringement carried out by their users. While the rules were designed with search engines and Internet Service Providers in mind, the American Library Association recommends that libraries register for such protection in case of infringement by those using public wireless or PCs. To secure these protections, libraries must register a Designated Agent with the United States Copyright Office. This person serves as the contact for any copyright holder who is concerned that their copyright has been infringed. SELCO has registered me as the Designated Agent for public libraries in the region that get Internet through SELCO. In the event of a notification, we will work with the relevant library to resolve the issue. Each library for whom I am the DMCA Designated Agent must post that fact, along with my contact information, on their website where it can be found by copyright holders. To simplify matters, we have written it up as a Google Doc accessible to anyone on the internet and recommend you put a link to the document on your website. Each website is different but it is usually best to put the link in your footer or sidebar near your contact information using the link text DMCA Notifications of Claimed Infringement or DMCA Designated Agent. Please contact the Help Desk with any questions on the DMCA Designated Agent or for assistance linking to the document on your SELCO-hosted website. UPDATE 3:27, December 23, 2017: SirsiDynix has resolved the issue that caused Enterprise to go down. Apparently, an issue at their data center in Atlanta caused an outage for numerous customers. Enterprise is now functioning normally. Thanks to SirsiDynix for fixing the problem but, more importantly, thank YOU for your patience today. The Enterprise public access catalog is down. We have contacted SirsiDynix emergency support and they are investigating; it looks like a number of their customers are suffering the same issue. We will post further information as the situation develops. Thank you for your patience as we work through this issue.